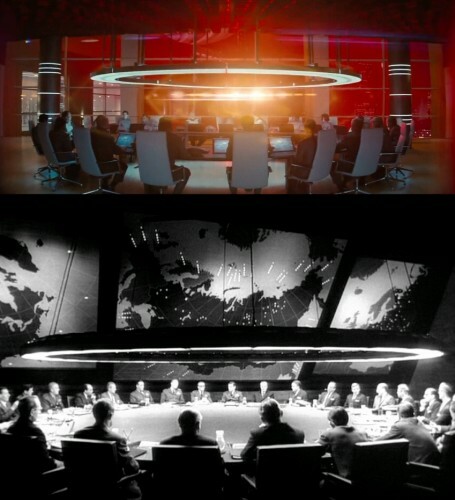 As best I can tell, the first person to notice that Starfleet Headquarters looks like Dr. Strangelove was SSgt Burton on an RPF message board. First, let’s get something straight. Khan Noonien Singh is a genetically engineered human reigned over almost half of planet Earth from 1992 to about 1996 before being overthrown by rebels. Khan, along with a number of loyal superhumans, leave Earth in a sleeper ship named the SS Botany Bay and float in space for over a hundred years before Kirk finds the ship and reawakens them. He was the product of many different ethnic groups but identified as a Sikh. In non-canon novels written by Greg Cox, Khan’s reign was run through secret shadow governments that ran throughout Asia and Eastern Europe in the 90s. The Khan that we see in 2013 looks more like a conniving bond villain than “the best of the tyrants.” Khan is a terrorist, not a deposed dictator. He is also white, which can be read as either Abrams’ total disregard for the multicultural message of Star Trek, or as hesitancy to cast a person of color as a terrorist in a movie that echoes American interventionism a little too well. Khan must be a terrorist and he must be white to the point of transparency because to do otherwise in one of the longest-running parables of western civilization would be too problematically formulaic for Abrams or the American movie-going public to accept. That’s because tyrants don’t scare us anymore. They’re always the mustachioed men with weird obsessions and dubious military support. We’ve toppled a dozen of them since the 2009 Abrams movie and what scares us now are rogue agents with confusing loyalties. People that we know are armed and dangerous because we made them that way. Khan is blowing up Starfleet because they used him and manipulated him to built a war machine capable of defending against people like Khan. Self-justifying, perpetual war machines are what we have come to expect from governments. Even if you are defending the war, you have to justify this “new kind of war” by describing and identifying an enemy that demands a war of ambiguous lines and endless horizons. Talk about policing, intelligence, boots on the ground, or peace-keeping missions but don’t question the need for constant intervention. J.J. Abrams’ Star Trek might not be the Star Trek you want, but it is definitely the Star Trek America deserves. 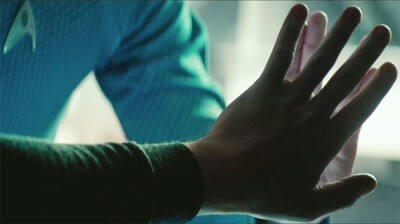 To that point, Abrams reduces Kirk to a horny frat boy and Uhura to a doting girlfriend. Its hard to tell if this is something we can blame on Abrams’ love of Star Wars or the fact that America’s gender politics have gone into such a horrendous retrograde that we can’t expect much else from either character. Both have their moments, (and they’re amazing when they happen) but ultimately we have to accept that the Abrams alternate universe is not nearly as aspirational as the Roddenberry universe and perhaps that’s just what we need right now. I want to back up for a moment and delineate the path that brought us here. The original series always had a Janus face for a political message: mutually assured destruction is no way to win peace, but you will always have to be ready to defend yourself against avowed enemies just on the other side of The Neutral Zone. Kirk and his crew rarely live their politics: when faced with warring civilizations the crew invariably destroys the very tools that make war clean, easy, and desirable. A clear message to super powers that are more than happy to fund proxy wars but never fight on their own soil. It is a hypocritical edict handed down from a unified humanity that will let a proud Russian steer the ship but allow a deep hatred for Klingons (who sport fu manchus and fight for the glory of the empire) run rampant in their ranks. It’s no surprise that as the Cold War fades into detente, the Federation signs a peace treaty with a Klingon Empire crippled by the self-inflicted wounds of over-production and infighting. The Next Generation is equally fraught with paradoxes borne out of the same unwillingness to live one’s stated politics. At the height of Reagan America, a French archeologist presides over a UN In Space that has welcomed a Klingon (naturalized into the Federation by human parents) to the bridge but despises the children that he simultaneously hates and desires for himself. It is a series that, appropriately enough, opens with nothing less than a trial of all humanity heard by an omnipotent trickster god. It is a Star Trek that fully realizes Fukiyama’s decree that we are living at the end of history and all that is left to do is reconcile past differences and perfect an already spectacularly efficient system of exchanging goods and services. But then there are the rights of the individual in this matter. I find it impossible to support immortality forced on an individual by the state. The unforeseen disruption that may occur in the continuum is not enough, in my opinion to justify any additional suffering by this individual. Deep Space Nine shows us the morally dubious and difficult decisions that prop up great societies. It reveals the Federation as a dubious unity: a patchwork of good-enough decisions and lukewarm compromises that have more to do with who is in the room than universal morality. It requires unilateral decisions by imperfect people. It means ignoring the plights of others to prevent all-out war. DS9 complicate the Star Trek universe to the point of breaking, but it does show us the tattered edges and lose ends of what we thought was an expertly woven tapestry. Star Trek as we had known it dies with Data –someone who’s sole purpose in life was to understand everything Star Trek was about—in the final Star Trek movie with the Next Generation Crew. This universe must die because we are no longer living in a world after history. America’s War on Terror is incompatible with the Gene Roddenberry vision of a socialist utopia that provides for every want and desire. Self-actualization is no longer a realistic goal once a week. The franchise struggles briefly through four seasons of Enterprise (which debuted just 15 days after 9/11) to translate the utopia of the 23rd and 24th centuries into a story of plucky, modest, and messy 22nd century progress. It fails because the opening credits have none of the grandeur and stateliness of the other series, nor does it evoke anything new that we can believe in. We do not even believe we’re on our way to utopia. J.J. Abrams, a man that has openly stated that he does not want to write or produce a philosophical Star Trek, produced the perfect meditation on the 21st century political condition. The generals of the Cold War have been massacred by a terrorist of their own creation, and must be saved by the young mind that has known nothing but this alternate universe of endless war. The Klingons are less like the Soviet Union and more like Pakistan: Admirals are content with sitting on the border and shooting missiles at individual targets based on bad intelligence. 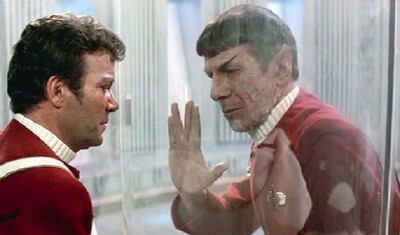 Kirk always served as the balance between Spock’s logic and Bones’ passion. He took the best of each and applied them to the problem at hand. Kirk mediated this Enlightenment-era dualism of emotion and reason through the values of the era. 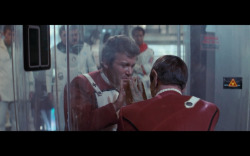 Kirk’s job as captain was to apply reason and passion for the sake of the good and just. Whereas, in Roddenberry’s The Great Society, you defeated your enemy by sacrificing logic temporarily by letting it live inside passion (something cyberneticists and cognitive scientists would appreciate) the War on Terror asks that we sacrifice that part of ourselves that balances passion and logic through values (patriarchy and all) and let both weep at its loss. We only resurrect ourselves by sticking to a moral code that rejects revenge killings and seeks justice: letting your enemy stand trial restores you. It means letting your passion infuse you with the blood of the enemy. The Star Trek universe is a foil for our own. When we watch Star Trek we see the hopes, dreams, fears, and optimism of a generation reflected back at us, draped in over-wrought Shakespearean acting and goofy uniforms. Star Trek, like most good science fiction, lets us step out of ourselves and talk about humanity, the state, and individual freedoms without the trappings of real world political parties and geopolitics. 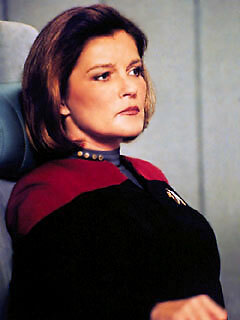 I can have a deep conversation about the state’s role in governing bodies by talking about Voyager, not Foucault. That’s the power of good story telling. I know that Slate’s Matt Yglesias has recently written about the Star Trek franchise and he hits a few good marks, but he generally misses the mark entirely. (Proton torpedoes? What are you, new? ) The fact that he calls the DS9 metafiction episode “Far Beyond the Stars” as “bizarre” says everything you need to know about Yglesias’ shallow, elitist, milquetoast read of the Star Trek universe. Ronald D. Moore the writer of Battlestar Galactica and several episodes of Deep Space Nine (not this one) said it was “one of the best episodes in the entire franchise.” I am not surprised that Yglesias doesn’t see any “particular connection to Trek’s distinctive themes.” Its easy to see the Cold War allegory when it is long gone, but it takes an iota of thoughtful consideration to see your own world reflected back at you. 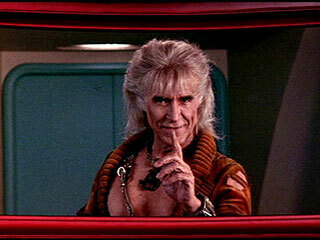 Correction: The post originally misspelled Khan as “Kahn” because, well, irony I suppose.